There is a town in south western Poland, about 70km from Kraków, called Oświęcim. When the Nazis invaded in 1939, they found a barracks complex there that would become very useful to them, with its good rail links from the rest of Europe. They used it first to imprison, overwork and execute Polish ‘political’ prisoners, and Russian POWs, and any Jews they came across. Later more Jews started arriving. 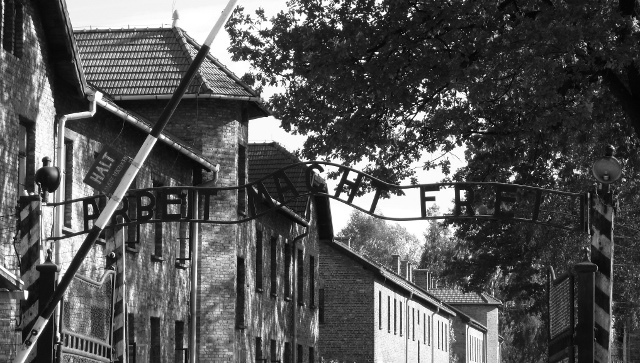 Newcomers were given hope by the Arbeit Macht Frei sign over the gate. Perhaps work really would bring freedom. When the Nazis started implementing their catastrophic final solution for Europe’s Jews, this camp just wasn’t big enough. They had experimented with gas chambers here, and had built one together with its accompanying crematorium. This was hardly going to cope with the job in hand. Using their prisoner-labourers, they had built another camp, displacing the village of Brzezinka, on a much bigger scale. Rows of barracks for 300,000 people at any one time, originally intended for POWs. 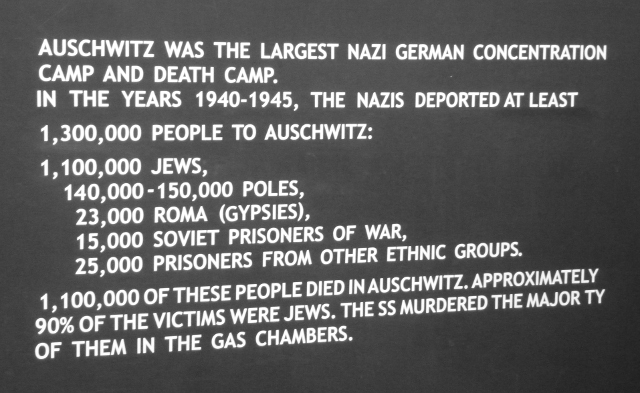 There were four gas chambers and crematoria. The railway took its cramped and exhausted human cargo right into its core. The Nazis Germanised the Polish names, Oświęcim became Auschwitz, and Brzezinka became Birkenau. 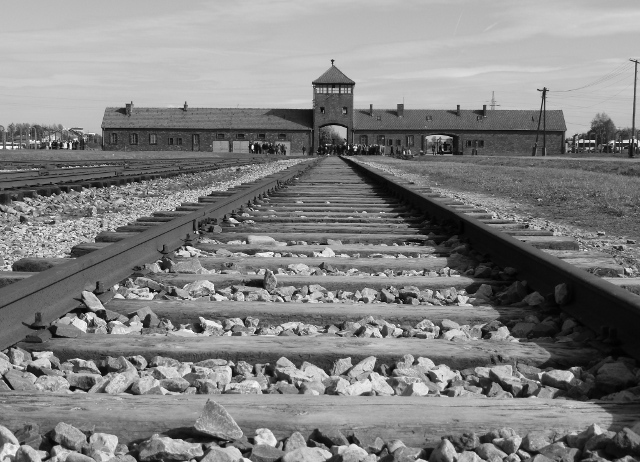 These camps are known as Konzentrationslager: KL Auschwitz I, and KL Auschwitz II – Birkenau, there were also several other sub-camps in the vicinity. The names send a chill to the heart, so synonymous are they with the destruction of human beings on an incomprehensible scale. At first, you simply enter bare rooms with a few information boards, stark images and texts, some figures. Your guide fills in the details, gives instructions on how to file through the rooms. Everyone is quiet, respectful. Even though you spend more than three hours here, it still feels rushed, no time to linger, to take stock of what you are witnessing. You can’t afford to lose your group or find yourself in the wrong group, there are so many traipsing through. 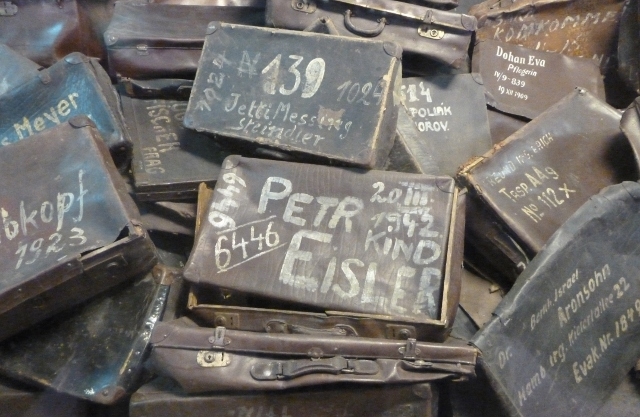 You see gigantic glass cases of belongings: thousands of shoes, some elegant and stylish as well as those that are broken and soiled; pots and bowls, glasses, toothbrushes; the suitcases with names, often dates of birth too, painted on them; the prosthetics – crutches, limbs, braces – of those who would have been selected to proceed directly to the gas chambers. The room where you can’t take pictures – because there is human hair. A lot of human hair. The Nazis not only plundered the possessions, but also the corpses. I found myself trying to picture the living breathing people that ended their lives here, the people that had worn those shoes, used those items. You can’t take in the numbers, so you try to see their faces in your mind. You see a large scale model of the gas chamber and crematorium system – it was a system, a conveyor belt of death. 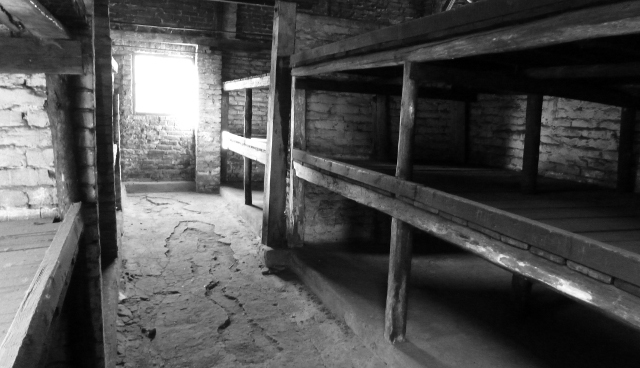 You enter the basement where the first gas chamber experiment took place, you see punishment cells – standing cells where four people would be held standing for hours in complete airless darkness in a space that would be tight for one of them. You walk through the real gas chamber and see the crematorium here, the only one still standing, just a stone’s throw from the camp commandant’s house where his children used to play in the garden. 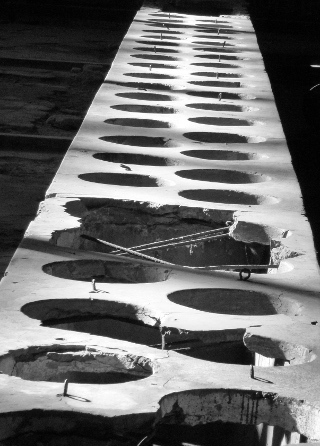 Latrines – prisoners could only use these twice a day, and then only for ten seconds. The group then walks quickly to the exit to crowd onto a bus for Auschwitz II – Birkenau. You can visit this site without a guide, but you learn much more with one. It’s on a vast scale. Your mind really can’t take in the scale, the figures, the selection of arrivals, the descriptions of the horrendous conditions – the humiliation, degradation, dehumanisation. The fact that an estimated 1.1 million people died here. 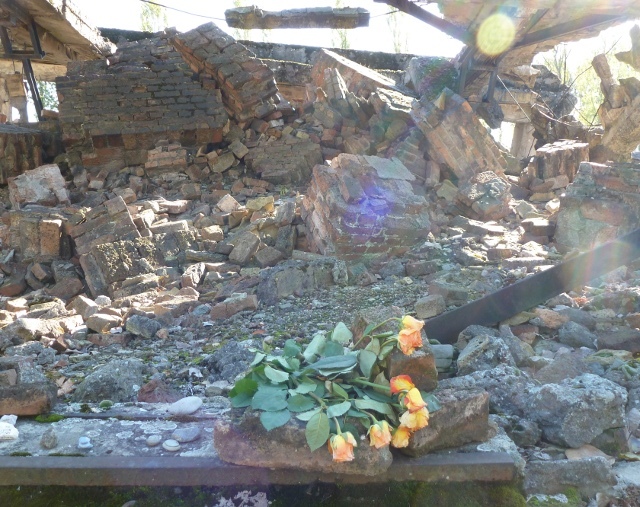 You see the ruins of gas chambers blown up by the SS before they ran away, the Red Army when they arrived, and one by the Sonderkommandos when they tried to revolt in October 1944. This latter group were Jews put to work on processing the corpses from gas chamber to crematorium, among other things, and were themselves replenished and replaced at regular intervals, having witnessed too much. You see the memorials – plaques in 22 languages – of all the peoples who are remembered here. You enter the brick barracks, roughly and hurriedly built, still with the wooden bunks that slept four or more to a bed, on straw. Poorly heated. It can be as low as -25C in winter here. At the end our guide asked if there were any questions? No questions. But so many burning to be asked. But there are really no answers. It’s a place you are compelled to come. To remember, to bear witness, to pay tribute. To try to imagine the unimaginable. Like the many Israeli youth groups making a pilgrimage, bearing flags, bringing flowers. Unfortunately, these words are too often unheeded. This entry was posted in By Country - Poland, Personal stuff, Travel stuff. Bookmark the permalink. Ellie, I think it takes real courage to visit Auschwitz, thank you for writing about it so honestly. I really am choked and lost for words.. Thanks for your post Ellie. I’m lost for words. I’m not sure I’d have the courage to visit.